Born in Onitsha, Nigeria, poet and philosopher Ifeanyi Menkiti came to the United States to attend Pomona College, where he wrote a thesis about Ezra Pound. He went on to complete a PhD at Harvard under the great political philosopher John Rawls. 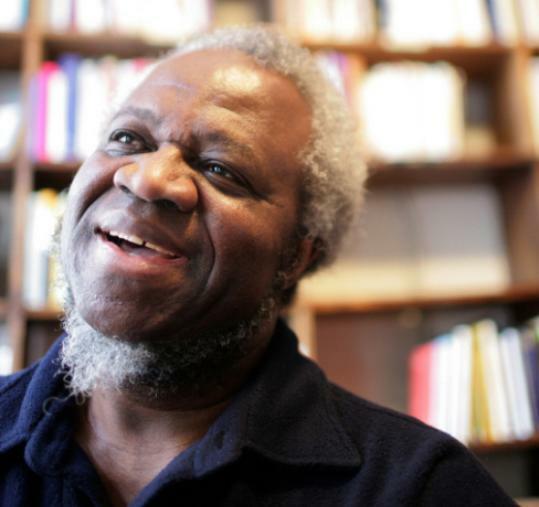 Since 1973, Menkiti has taught philosophy at Wellesley College, while continuing his work as a poet. In 2006, he took on yet another role, as proprietor of Harvard Square’s venerable Grolier Poetry Book Shop. He spoke to us between classes, from his office at Wellesley. What made you interested in Ezra Pound? So part of what attracted you was the rhythm? Yes, and the way he deployed language. This is the ordinary language of the human tribe, regular English. But the way he deployed it, and this rhythm I could identify with, not all the cantos are this way, but that’s one that appealed to me. With poetry, for me, it’s almost as if we live in this song-denominated universe. The music that resides inside the human tribes of the world, and the tears that the nations cry, their joys, it’s as if they’re not able to cry or have their joy unless they encode it in song. Growing up in Nigeria, there was a lot of song in the air. As you get older, those things come back. I’ve done quite a bit of work with Pound. Of course, there were other issues surrounding him, but way before globalism, he was doing globalism of culture. He was really interested in Chinese stuff. It’s a global engagement, and that is so important for me. What other poets are important to you? There’s a young Nigerian poet who died during the civil war, Christopher Okigbo. He was very good. But he died young, at the age of 35, I think. Okigbo was so gifted with language, and then this incredible gift got married to serious political issues. I like work that is engaged in public life. I read T.S. Eliot. I’ve enjoyed David Ferry’s poems, his translation of “Gilgamesh,’’ and his own work. I’ve enjoyed poems by Theodore Roethke, and by my colleagues Frank Bidart and Robert Pinsky. Mary Oliver is very good. Maxine Kumin. Do you follow the younger generation of Nigerian writers? Yes. Chimamanda Adichie, E.C. Osondu, there are young writers coming out of Nigeria who are very strong voices. But Chinua Achebe opened the way for them all. Without his impact on African literature, it’d be very different. With two careers already, why did you want to run a bookstore? I just didn’t like the idea of this wonderful place folding. I don’t know too much about retail; I went into it with my heart and decided to learn the practical side. When I first came to Cambridge, I knew Gordon Cairnie, who opened the store [with Adrian Gambet] in 1927. The store has had only three owners in 85 years: Gordon, Louisa Solano, and myself. It’s a place that’s been associated with T.S. Eliot, e.e. cummings, Robert Lowell, Creeley, Bishop. There’s a lot of history, and I thought, “Let’s see what we can do to keep it going.’’ Because I believe strongly that poetry can still help heal the world.